For other uses, see Burin (disambiguation). Burin /ˈbjuːrɪn/ from the French burin meaning "cold chisel" has two specialised meanings for types of tools in English, one meaning a steel cutting tool which is the essential tool of engraving, and the other, in archaeology, meaning a special type of lithic flake with a chisel-like edge which was probably also used for engraving, or for carving wood or bone. An engraving burin is used predominantly by intaglio engravers, but also by relief printmakers in making wood engravings. Its older English name, still often used, is graver. The burin consists of a rounded handle shaped like a mushroom, and a tempered steel shaft, coming from the handle at an angle, and ending in a very sharp cutting face. In use, it is typically held at approximately a 30-degree angle to the surface. The index and middle finger typically guide the shaft, while the handle is cradled in the palm. 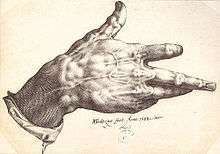 Of note is the 16th-century Flemish engraver Hendrik Goltzius, whose malformed hand was ideally suited for the cradling and guiding of a burin. 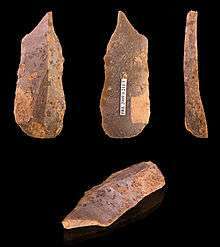 In the field of lithic reduction, a burin is a special type of lithic flake with a chisel-like edge which prehistoric humans may have used for engraving or for carving wood or bone. Burins exhibit a feature called a "burin spall", in which toolmakers strike a small flake obliquely from the edge of the burin flake in order to form the graving edge. Burin usage is diagnostic of Upper Palaeolithic cultures in Europe, but archaeologists have also identified it in North American cultural assemblages, and in his book Early Man in China, Prof. Dr. Jia Lanpo of Beijing University lists dihedral burins and burins for truncation among artifacts uncovered along the banks of the Liyigon river near Xujiayao. An example of a type of burin diagnostic of the archaeological stratum where they are found is the "Noailles" burin, a small multiple burin characteristic of the Upper Paleolithic cultural stage called the Gravettian, ca. 28–23,000 BP; these flake tools have been restruck and refined to give several chisellike edges and a blunt, grippable rear edge. ↑ Alexia Rostow. "Porcuprints-Printmaking". Retrieved 2011-08-06. ↑ Named for its original find-site, the Grotte de Noailles, in the commune of Brive-la-Gaillarde, Corrèze, in southwestern France.